Are you looking to gain competitive edge by adopting a mobile marketing strategy? Is your market research team trying to track every move of your competitor? Or is your marketing team struggling with content marketing strategy? The one solution to all your strategic problems is aMarketForce’s strategic marketing and research services. From large companies to SMBs – everyone needs 3rd party help while dealing with new strategic marketing initiatives. Market research is an integral part of strategic decision making. 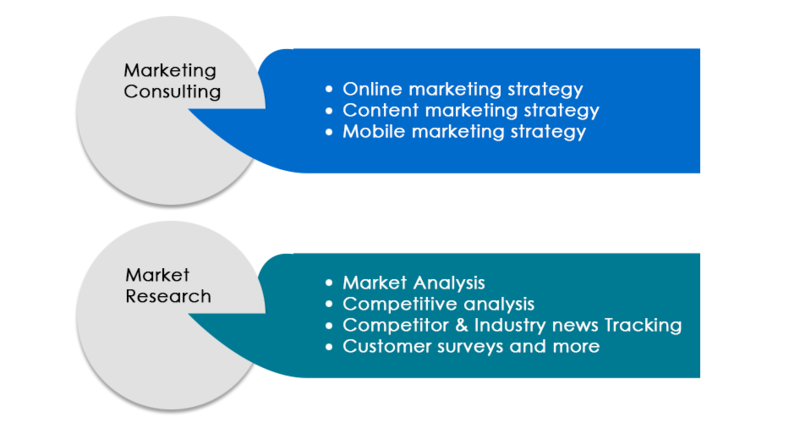 aMarketForce offers end-to-end strategic marketing consulting and market research services. The Market Research services provide clients’ with invaluable insight into their marketing space. aMarketForce’s diligent and knowledgeable market research agents can provide clients with regular updates on new product announcements, product pricing comparisons, customer opinions and satisfaction, competitors’ positioning, current and future market trends, and much more. The Customer Satisfaction and Loyalty services help clients understand the reason for customer dissatisfaction. aMarketForce designs and executes statistically designed end-to-end customer surveys and then analyzes the data collected, coming up with valuable information that you might have missed. aMarketForce’s Vertical (Competitor) and Horizontal (Industry) News Tracking services provide clients with weekly detailed updates on market trends, industry changes and competitors’ news. aMarketForce’s highly-skilled market research agents utilize leading technology to find the right information as soon as it becomes available. The Content Writing services helps clients’ with content marketing strategy by developing content for your website, blogs and technical documents such as user manuals, installation manuals, training manuals and more. aMarketForce’s Mobile Marketing services includes mobile website development and mobile apps development for marketing and sales. aMarketForce’s parent company, V-Soft Inc. is a premier software development company that specializes in leading-edge mobile application development. aMarketForce helps clients by integrating online marketing processes with offline marketing processes and thereby creating an end-to-end B2B marketing strategy. aMarketForce supports planning and implementation of multi-channel online marketing campaigns. Contact us to learn more about our strategic marketing and research services and the other ways we can support your marketing and market research team. Request a Quote for B2B inside sales and integrated marketing services.